A page in an ASP.NET application consists of several server controls. These are the fundamental building blocks of an ASP.NET application. 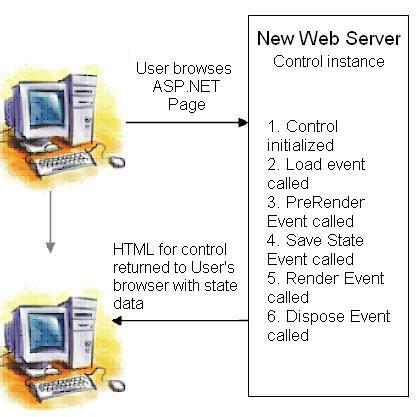 The Life cycle of an ASP.NET page, depends on whether the page is requested for the first time or it is a postback. 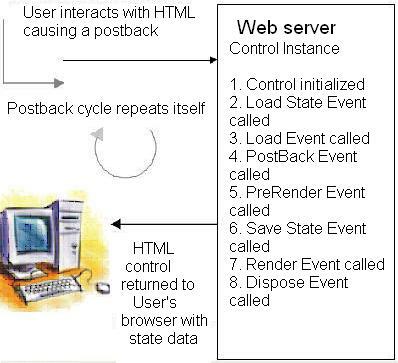 Postback is a process by which a page can request for itself. Loading: During this phase, the instance of the control is loaded onto the page object in which it is defined. PreRendering: During this phase, the control is updated with the changes made to it. This prepares the control for rendering. Saving: During this phase, the state information of the control is saved. For example, if a value is set for the control during the Load event, it is embedded in the HTML tag that will be returned to the browser. Rendering: During this phase, the server creates the corresponding HTML tag for the control. Disposing: During this phase, all cleanup tasks, such as closing files and database connections opened by the control are performed. Loading view state: During this phase, the view state of the control posted by the client is reloaded into the new instance of the control. Loading the postback data: During this phase, the server searches any data corresponding to the control that is loaded in the data posted by the client. Saving state: During this phase, the change in the state of control between the current request and the previous request of the page is saved. For each change, the corresponding event is raised. For example, if the text of a textbox is changed, the new text is saved and a text_change event is raised.